Can Getting an A in Spanish Class Keep You From Learning to Speak Spanish? 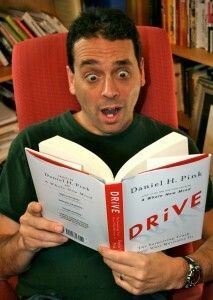 According to author Dan Pink, grades really don't motivate us to do something like learn Spanish. You might guess that getting a reward like money or a good grade would really motivate us to do something good like learn Spanish. But according to Daniel Pink, author of “Drive – The Surprising Truth About What Motivates Us” that’s not how motivation works. Read more about how to improve your motivation to learn Spanish.